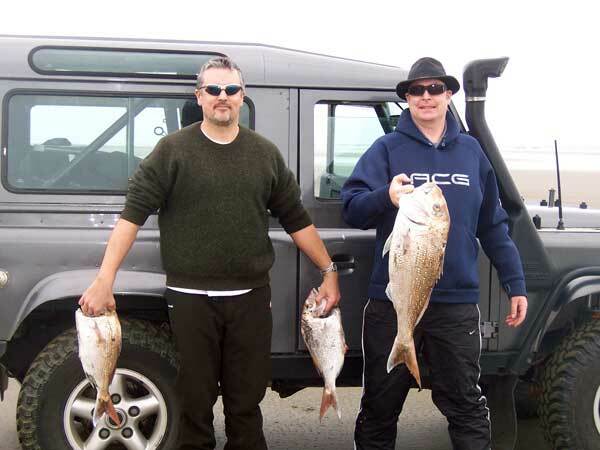 Neill Sperath and Paul Barnes are planning a fishing trip to Muriwai Beach next time we get a good easterly blow and would like extend an invitation to all who are interested in coming along. This is a free trip! They will take several kite fishing rigs and be demonstrating novel techniques and specialist kites and rigs. If you are interested put your name forward here. You will be contacted a day or two before the trip. 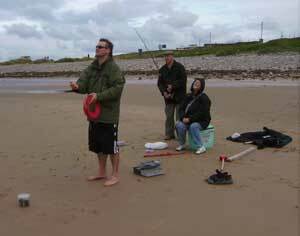 Register for the FREE KITE FISHING DEMO here. 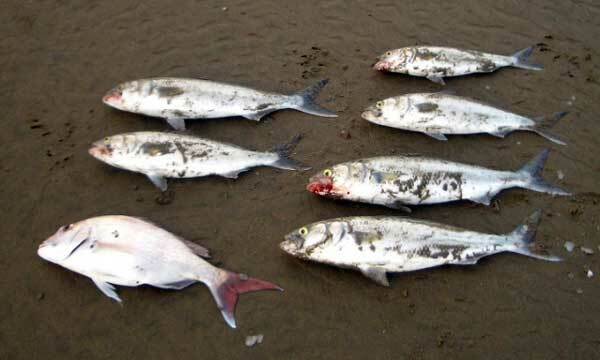 Over the years I’ve been a very occasional and distinctly average surfcaster, catching the odd kahawai but mainly throwing pilchards into the surf with not much success. One day I wandered over to a guy kite fishing a bit further down the beach from us and could see he was hauling in a good catch of snapper. That got me very interested in figuring out how this kite fishing thing worked. I could see that getting the hooks out behind the breakers would be a distinct advantage. My mate and I agreed to go halves in a basic kite fishing rig from Pauls Fishing Kites and give it a try. Well, it's now a few months later and I’m happy to tell you what we’ve learned so far as complete kite fishing novices. The first thing we learnt was to look for favourable offshore winds. 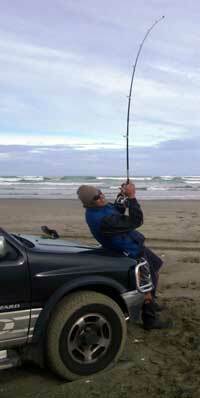 With beginners luck, our first trip out to Muriwai had quite a stiff breeze directly offshore. The sand was blowing on the beach so it was probably 20-30 knots of wind. This makes life very easy as the kites have a lot of pull in strong winds and that allowed us to use the full 25 hooks that our rig could carry. Well we were going to use them all anyway as we didn’t know any better, but now we know that trickier winds – angled or just lighter breezes – can still be fished but you might need to lighten the load to compensate. The second thing we learnt was to keep the kite flying and fishing instructions handy. The fishing rigs are actually pretty simple, but the diagram of where everything attaches was very useful. I’ve stuck the instructions in a plastic folder as we refer to them quite often. Having set it up wrong on our first attempt it still flew and caught fish, but it worked even better when we set it up right. The next big lesson learnt was to put the kite up first and get it flying correctly. There are some adjustments for wind angle (tacking) and wind speed (which eyelet you hook onto) that let you fine tune the kite to suit the wind. Once you’ve done this the kite will fly a lot better.There are specialist light wind kites available as well and these give much more control when fishing in light breezes. The guys at Paul's Kites recommended we purchase a large Dropper Rig for fishing the west coast. On this rig the hook line dangles into the water from the main line flying the kite. This keeps the main line out of the sea which is great if there is a rip running. On the dropper line is a float (milk bottle half full of sand) and underneath that a weight, and the hook section. You have to adjust these to suit the conditions on the day. Our first attempt, we didn’t put enough sand in the bottle or weight on, and the whole lot was flying in the air. As we figured there were no flying fish around we hauled it in and added a second bottle of sand and that turned out just right. Since then we’ve found out this is the crucial piece of the exercise. Basically the kite can only pull so much weight - which varies with the wind (and how you’ve tweaked the kite) and you need to alter the weight/drag of the rest of the rig (float/weights/hooks) to suit. Kite fishing is about balancing the pull of the kite against the weight of the fishing gear. Put too little weight in the bottle and the gear will lift off the bottom. Too much weight on the hook section or in the float bottle will overload the kite - there won’t be enough pull to drag the float, weight and hooks out through the breakers and holes with any momentum and the rig will stall in the breakers. This happened to us the first time. On the bright side, a school of big kahawai must have been in the breakers, and when we hauled the line in, we had 11 Kahawai on our hooks – not bad for 20 minutes! We chopped up some of the kahawai for bait, following the instructions given to us to use strips of bait with the skin still on, and to hook them at one end to minimise tangling. The next set we lightened the weights and carefully fed the line out as the kite pulled the rig out successfully fully through the breakers out the back this time. We waited 20 minutes and pulled it back in. Success! We had some nice gurnard and a few snapper, and something big that broke off in the surf. Now we were getting the hang of it, and we went for a much longer shot next time, getting the kite out about 1200 – 1500 meters. I was glad I had a pair of binoculars to keep track of it. We knew the gear was out in real snapper country this time. Sure enough, when we hauled in half an hour later we had half a dozen decent size snapper up to 5.5kg (12 pounds) a few gurnard, and a spotty shark (which we released). At this point we stopped fishing as we had 35 good size fish, if we had set again we would have been over the daily limit – a problem I have never had surfcasting! Our chillybin was overflowing and we headed back home pretty happy. I think this may have been real beginners luck, but we look forward to having another go soon – and now we pay a lot more attention to the weather forecast. I also got a small kite to use on my surfcasting rod, and I’m looking forward to giving that a try some time when the wind is favourable. 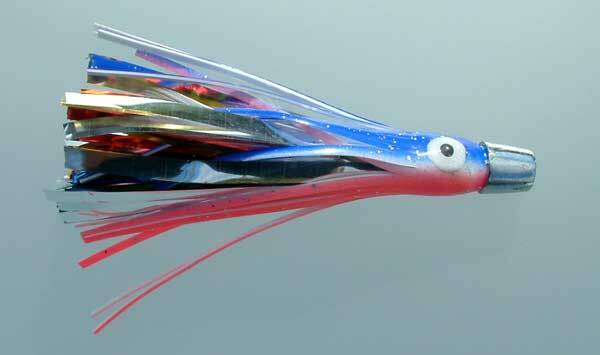 40% OFF Selected Fishing Lures! If you are planning on any big game fishing trip for the coming season, be quick and save heaps - These Offers are Valid Only While Stocks Last! Top Brands at rock bottom prices. Williamson, Eldingo Lumo, Big Red and Door Knobs. 40% OFF selected skirted game lures NOW. Available Rigged or Unrigged! 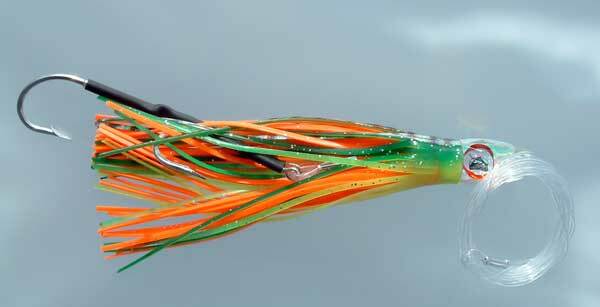 If you purchase un-rigged lures we will give you 30% off any game hooks and traces for DIY rigging! A Small sample of what is available rigged and ready to go! 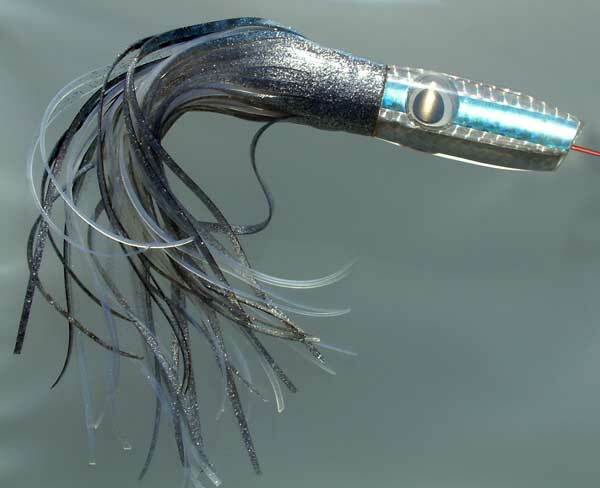 Big Super Squid Long Heads were $90.00 – Now Only $54.00! Small Door Knob Fish Skin Flyers were $28.00 – Now Only $16.80! Large Door Knobs were $115.00 – Now Just $69.00! We have a huge range of sizes and colours available instore. Visit our store at 39a Neilson St, Onehunga, Auckland to view the full range and get expert advice on the best lures for the species you want to target and the water colours and lighting conditions you may encounter while fishing. If you are in New Zealand ring for mail orders and/or more details. Overseas mail orders by email form only. Fill out the bottom part of our Tackle Enquiry Form with the words LURE SPECIALS and we will get back to you with our sharpest GST free prices. It was a stunning day with perfect wind conditions – no better time to go kite fishing on the West Coast near the mouth of the Kaipara Harbour. I went with T, a great Tongan/Kiwi guy and we accessed the beach at Rimmer Road and drove almost to the top of Muriwai Beach. When T’s car started smoking, we decided that where we were was as good a place as any to fish. A couple of sets and two snapper and six kahawai later, we decided we had caught enough to each have a great feed that evening. T had not kite fished before and absolutely loved it. So much, in fact, that he is now contemplating buying a flexiwing set from Paul’s Kites after this first kite fishing adventure in our great outdoors. Although we used both a flexiwing and a Big Dropper Rig, the big advantage of the flexiwing is that it’s easiest to use alone but with a little practice it is possible for a fit kitefisher to use either solo. However, fishing is always best with some mates – or in my case, with clients that I love showing how to use Paul’s Kites and especially my wife, since kite fishing can very much be a family activity. By the way, T's car survived the trip home, he reckons he had a great day at the beach and a good feed in the evening. My recommendation by the way is to smoke the Kahawai. A smoking oven is not expensive and ensures that especially the kahawai is prepared in the best possible way. 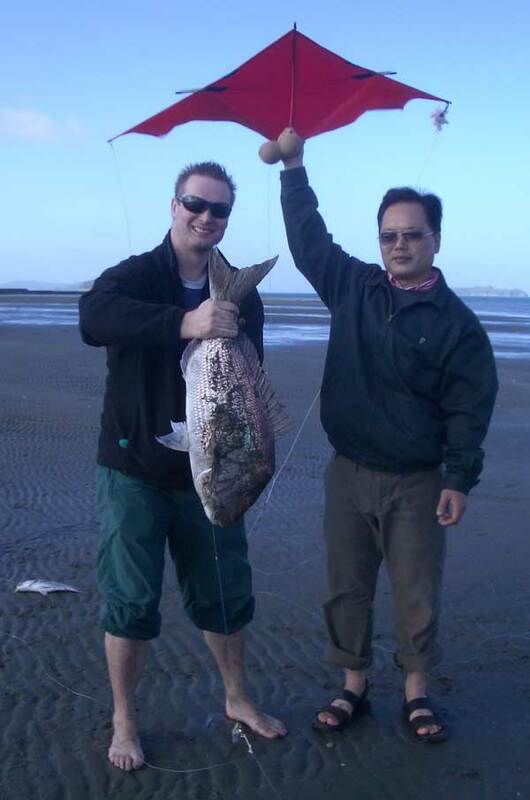 I had a guided kite fishing trip with a couple from Korea a few days ago. I took them to one of my East Coast spots. They were over the moon with the great fish we caught. Besides this beaut we also caught three snapper that were just legal and I decided to put them back to give them a chance to grow. Want to give yourself a treat? 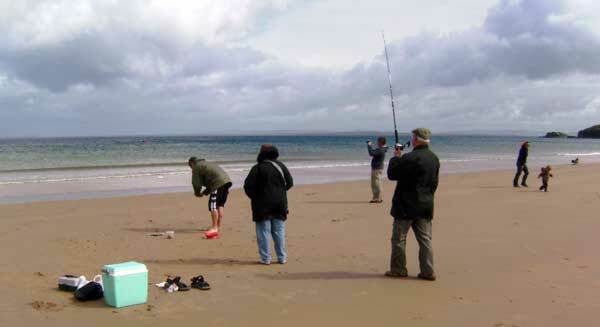 Book a private kite fishing demo with expert kite fishing guide Neill Sperath. We have just returned from a few weeks in Ireland, where we visited my parents and also took the opportunity to show some people over there how fantastic kitefishing can be. During the almost three weeks in Ireland, we went to 'The Mullet' and its main town called Belmullet, as well as beautiful Achill Island on the West Coast, where we spent two days. On our first day on The Mullet, the wind was a 15 knot northerly, which was ideal for fishing off a long pier about 15km from Belmullet. We used our flexiwing kite and the pier being three metres above the water presented no problems. The gear set out into a beautiful bay and we let the flexiwing kite out about 400m, hoping to catch one of the top local species such as dogfish or mackerel (we don't realise how lucky we are with our variety of desirable species). After half an hour we retrieved the line and were delighted to bring what the locals described as a beautiful dogfish - see photo below. Our activities created quite a stir with the locals, who hadn't even heard of kite fishing. Their comments ranged from "that is strange" via "that will never work around here" to a very surprised "what a nice fish you've caught on that contraption". Later on our trip we travelled on to Achill Island and kite fished from a nice beach called Dugort Beach in a steady 20 knot southwesterly. We certainly created a lot of interest. 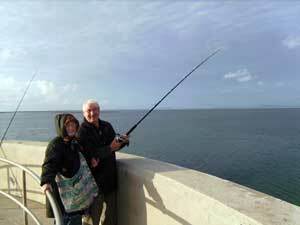 We took a local fishing tackle shop owner to the beach with us. He was quite amazed at our technique of catching fish. We were also joined by a dog that barked continuously at that funny thing (our kite) in the sky, a French couple that wanted to know what we were doing, a German couple plus several locals that were intrigued by our technique - and the catch - as the line came in. 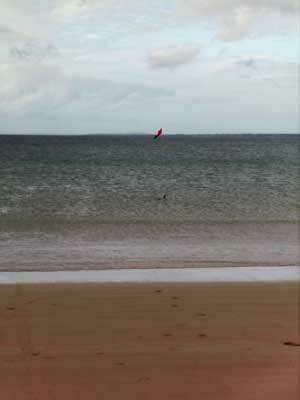 We spent some thoroughly enjoyable days kite fishing in Ireland and are looking forward to going back soon. By co-incidence the colours used on the indicator flag on Paul's Kites system, (the red and green flag), happens to be exactly the colours of County Mayo (one of Ireland's 32 Counties), where we were fishing. Of course we told the locals that those colours were specially chosen for County Mayo and that caused a good laugh! Good Fishing from Neill Sperath from T.I.M.E. Unlimited! Above: The pier we fished from. 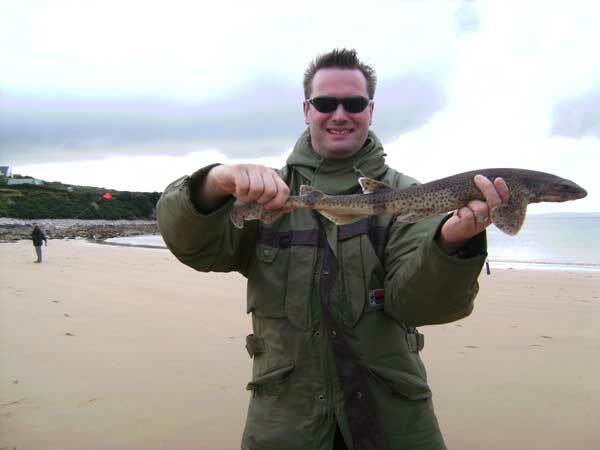 The dogfish in Ireland are slightly different than the ones we catch in New Zealand.